Committing to healthy eating is wonderful, but let’s face it: it can be a lot of work. Piles of veggies, endless meal prep, obscure pantry items…sometimes you just want someone else to do the work for you. That’s where Sakara comes in. They’ve done all the nutritional planning and cooking for you, and all you have to do is sit back and enjoy. 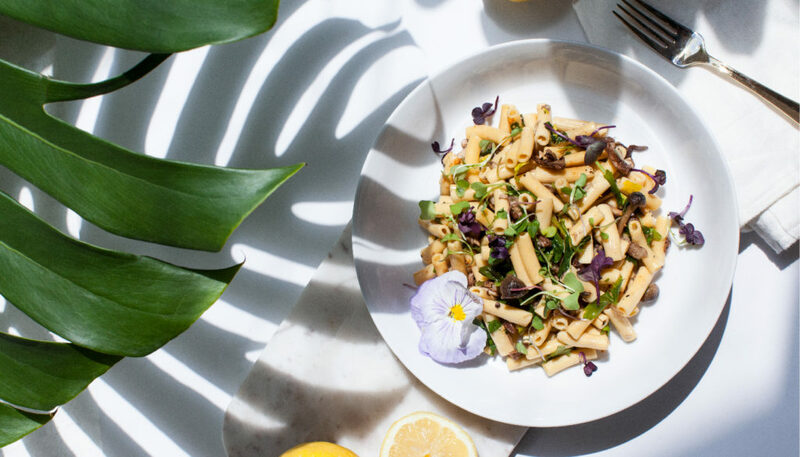 I was lucky enough to try Sakara’s signature 3-Day Meal Plan, and I can confidently say up front that it was the best meal plan I’ve ever tried. Keep reading for all the insider info on the meal plan that celebrities and savvy girls look to make healthy eating easy (and delicious). Also, at the end of this article we’ll have instructions on how to access an exclusive discount code for your first order! Depending on whether you choose a 3-Day or 5-Day plan, your meals will arrive in one or two shipments, respectively. I was on the 3-Day plan, so all my meals arrived in one delivery. I’m not going to lie, I was geeking out a bit opening up my box. All of your meals are packaged in neat little containers (which are 100% recyclable! 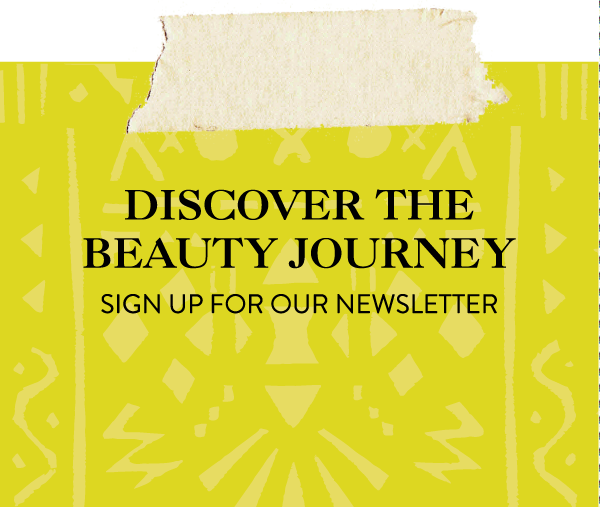 ), and you also receive some of Sakara’s Clean Boutique staples, like their Beauty Water, Chocolate Probiotics, and their delicious Detox Tea. You’ll also receive an itinerary for when to eat each meal, and information on how to heat up certain meals if you choose. First thing in the morning, you drink a glass of Beauty Water, a heavenly rose-flavored concentrate with Rose and Silica that you add to cold water. It’ll hydrate and boost your skin, and the mild rose flavor is such a lovely way to start the day – I look forward to this every morning. Next up is breakfast, my favorite meal of the day. I have to say, Sakara knocked breakfast out of the ballpark. My first breakfast was an outrageously delicious Heart-Opening Breakfast Bowl with Rose Petal Golden Milk. I also enjoyed a decadent Chia Pumpkin Bread with Cacao Crème (chocolate with breakfast? yes please!) and Plant Protein Granola with Maple Mylk. You brew a few cups of Detox Tea. 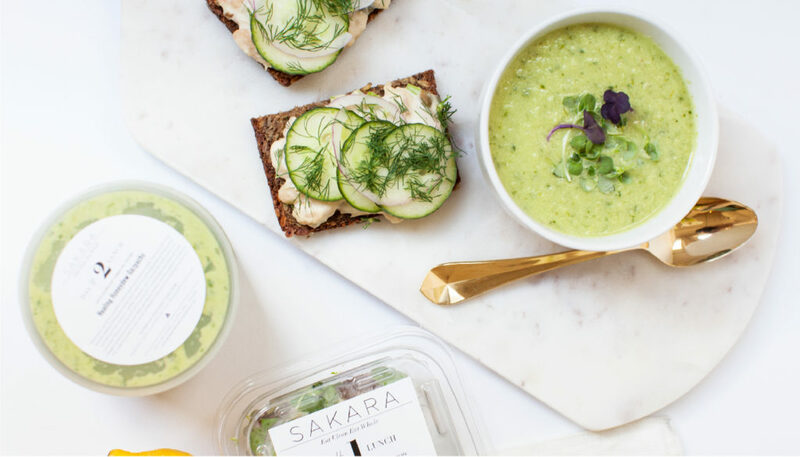 Sakara suggests having it mid-morning and mid-afternoon, which was great for me because those are typically my “mindless snacking” danger zones. The natural vanilla in the tea made it feel like I was having a treat, and it was easy for me to stay away from chips and sweets. After a soothing cup of Detox Tea, you move onto lunch, which for me meant a lot of awesome salads. From a delicious Harissa Falafel with Cashew Tzatziki and Ruby Hummus to a bright Matcha Udon Bowl with Yuzu Vinaigrette, I could tell that Sakara put actual thought into these salads. They were packed with flavor, and it’s honestly been a while since I’ve enjoyed salads so much. Dinner is next. All of my dinners had the option to heat them up, which I took advantage of. It was really nice as many pre-packed meal plans are all cold items, and sometimes you just want something warm and comforting. My two favorite dinners were my Heirloom Tomato and Eggplant “BLT,” and a Wild Mushroom Pasta Bowl with Truffle Oil and Sauteed Spinach. Any meal plan that includes pasta is a winner for me! Lastly, before bed, you have your Detox Water Concentrate. Like the Beauty Water, you also add this to a glass of H2O, but the Detox Water is full of chlorophyll and minerals to help cleanse and hydrate the body. It’s the perfect capper to a day of healthy eating! No. In fact, one of the big tenets of Sakara is that their plan is a lifestyle, not a diet. It’s one of the reasons why you’ll never find calorie counts with their nutrition and ingredient info. If you’re eating right, nourishing your body, and controlling portions, you shouldn’t be stressing over calories. While a typical side effect of the Sakara meal plan and lifestyle is weight loss, it shouldn’t be your do-or-die goal. How will a 3 or 5-Day Meal Plan help me in the long run? The thing I loved the most about the Sakara meal plan is that it teaches you what day-to-day healthy eating should look like and feel like. Ultimately, no one can be on a meal plan every single day (although they do have a fabulous subscription program), and one of the biggest failures of extreme juice cleanses and crash diets is that they don’t teach you anything about eating right. Sakara is different. First of all, you get The Ultimate Guide to Sakara Life with your first order. It is chock full of information about healthy eating, healthy living, and what to expect while on the Sakara plan. Your actual meals also come with awesome descriptions about what the ingredients are, and how they’re going to benefit your body. It really makes you more mindful that food is fuel, and it certainly made me appreciate my meals more. Will I experience any “detox” side effects? Real talk, I experienced some bloating the first two days. While it was the only “detox” side effect I experienced (and it completely disappeared by the third day), you have to remember that suddenly eating way healthier is an adjustment for your body. Even if you are a fairly health-conscious eater already (like me), you’re still transitioning from maybe 40/50/60% healthy eating to a full 100%. Everyone is different, and while you may not experience any side effects at all, don’t get frustrated if you do experience a little bloating, sugar/caffeine headaches, or cravings. It’s all part of a process that will make your body cleaner and greener. So what were my main takeaways from the meal plan? I mean, come on! Writing for Around the World Beauty, you know I was all about the beauty angle. I enjoyed my Beauty Water every morning, and loved learning about all the skin benefits of the nutrients and unique ingredients in my meals. More than that though, I loved that Sakara, like Around the World Beauty, is about beauty from the inside out. Your skin, hair, and shape will benefit from healthy eating, but Sakara wants you to feel good from the inside out. Speaking of beauty, we have got to talk about these stunning meals. They were some serious Instagram bait! I’m that girl who has to take a picture of almost everything I eat, and these meals did not disappoint. From bright colors and luscious textures, to beautiful additions like edible flowers, the meals were almost too beautiful to eat! But of course, I did eat them, and not a single meal let me down. I can honestly say I’d eat every single thing again. I am impressed by how fresh all the produce stayed. 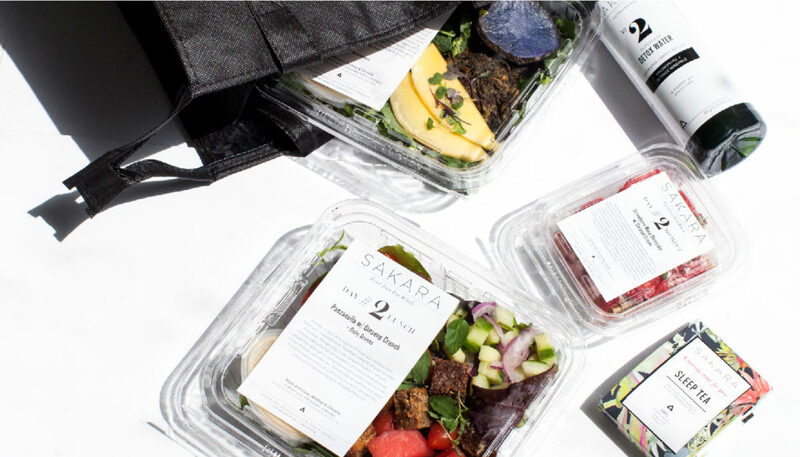 At the end of the day, the food on a meal plan has got to be good for you to stick with it, and Sakara delivered. 3. I need to eat more vegetables! This is the big one, people. I didn’t cheat, not once, not one little bite, nada. The biggest hurdles I have when trying to eat healthy are portion size and cravings. The portion sizes on Sakara were controlled, but not teensy, so I always felt satisfied. Also, my sweet and salty cravings are crazy strong, but the food was honest-to-goodness so good that I had no cravings at all. All-in-all, I can’t wait for my next Sakara experience, and I would recommend it in a heartbeat to anyone who is looking to feel better and eat well. Everyone invest so much into their hair, wardrobe, gym, makeup, and skincare, that sometimes what we’re actually feeding our bodies gets overlooked. Get glowing from the inside out — you deserve it! Excited to try Sakara for yourself? Head over to our Instagram story (@atwbeauty) for an exclusive discount code on your first order. Try their signature meal plan or their new 10-Day Detox!